A cathedral dating back to 11th century, Eglise St-Trophime is a masterpiece by the Romans at the great exhibition called the world. The St. Trophime , in all its wonderful details and elegance, was built on the site of an 8th century church dedicated to St. Stephen, the first Christian martyr. Magnificent, astonishing, brilliant are just a few words that will cross your mind on seeing the Eglise St-Trophime. It’s well preserved 12th century portal is the major attraction and is considered as the finest achievement of the southern Romanesque style. With intricate carvings depicting chained souls being dragged off to hell on the right side, and saints delivering justice on the left, the theme of the portal is the Last Judgement. Full length statues of the saints stand on either side of the portal with St. Trophime and St. Stephen at prominent positions. The inside of the Eglise St-Trophime is minimal but home to fantastically symmetrical designs and artworks in light pastel shades. 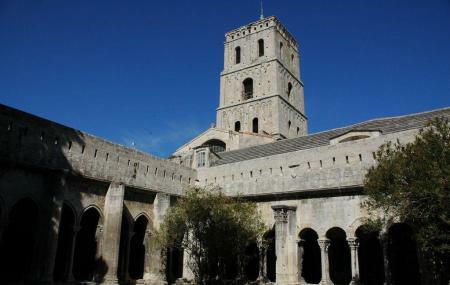 One of the great attractions is the cloisters of St-Trophime. These cloisters represent two distinct architectural styles thanks to the two different centuries they were constructed in. The north and east galleries of cloisters are 12th century Romanesque architecture while the south and west galleries are late – 14th century Gothic. The pillars of the cloisters are a thing of beauty, carved with fine sculptures of Biblical scenes. A rich history, magnificence and with the power to transform you back to a several hundred years make the cathedral a wonderful site to spend an afternoon learning. In 1981 the Eglise and Cloistre St-Trophime were declared as a UNESCO World Heritage Site. Shorter hours from October to April. How popular is Eglise And Cloitre St-trophime? People normally club together Les Alyscamps and Place Du Forum while planning their visit to Eglise And Cloitre St-trophime. A wonderful escape from the heat of the sun into this historic church. a Must See. Appreachiate the antique sarcophagi! Beautiful church that apparently began construction in the 12th century. Many of the tapestries appear quite faded but I think that adds to the charm and history. There is actually a huge collection of relics locked away in a church alcove behind metal bars. Otherwise, as with many other churches in France, there are tons of statues and paintings depicting stardard components of Christianity. Very beautiful.